Any article you read from this this week will echo the same opening sentiment. We are officially at the quarter mark of the season, 25% of the way through. This is the point where we can start weening off of 2016 data and start using data and averages from 2017 to make decisions going forward. This is also the part where I point out to you how short the football season really is. Don’t blink or you’ll miss it. In terms of targets and snaps, there are always interesting things to report each and every week. We update our stats pages every Tuesday, and the pages below are the ones I use to compile data for this weekly series. Hopkins, Brown, and Fitzgerald are all catching at least 63% of their targets. Bryant currently sits at a 40% completion rate, the third worse among all players with at least 20 targets. Only Amari Cooper (31 targets, 38.7% completion) and Kenny Britt (23 targets, 34.8%) have been more inefficient than Bryant. He faces a Green Bay Packers defense that, in their last meeting, allowed him to turn 12 targets into 9 receptions for 132 yards and two touchdowns. 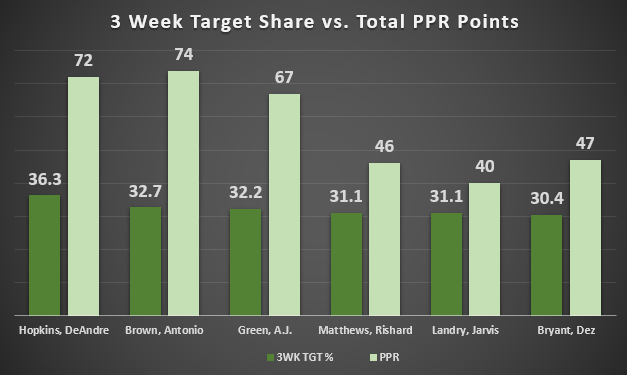 •	Below are all of the players with at least 30% of their teams’ targets over the past three weeks as well as their year to date point totals in PPR scoring. There is a clear gap between the bottom three and top three here. Rishard Matthews, Jarvis Landry, and Dez Bryant are seeing nearly the same opportunity as DeAndre Hopkins, Antonio Brown, and A.J. Green. At least 20 points separate them, with the biggest discrepancy being the 32 points Hopkins has on Landry, despite just a 5.2% difference in target share. Stefon Diggs is currently the WR1 and was drafted as a WR3 as the 29th receiver off the board. 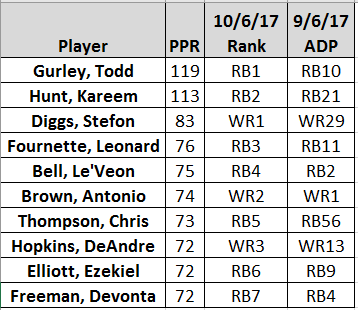 Chris Thompson (RB5) is massively out-performing his RB51 ADP. Through the first quarter of the season they are proving to be the biggest values in fantasy football. The Minnesota Vikings have been able to sustain two receivers in the top three in total yardage despite Sam Bradford being on the shelf. 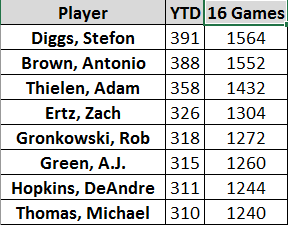 Zach Ertz and Rob Gronkowski are the leading receivers on their team and are on pace roughly 1,300 yard seasons. Missing from this list is 2016’s yardage leader T.Y. Hilton. Andrew Luck practiced for this first time this season yesterday. In goal line situations, Hilton has been completely ignored. Clay and Bryant, however, are seeing the majority of their red zone action from within the ten. Both of Clay’s red zone touchdowns were from the goal. Clay and Bryant have seen all but one of their red zone targets come from the goal line. Touchdown regression is imminent with that volume. Jason Witten is simply insane. Not only has he played every snap of the 2017 season but he is seeing 20% of the teams’ targets and 29% of the red zone targets. Despite finishing as TE10 or better in seven of the past eight seasons, Witten had an ADP of TE14 as of 9/6/17. He is currently the TE5 and just 18 points behind Zach Ertz (TE1). •	Todd Gurley (119) and Kareem Hunt (113) are neck and neck in PPR scoring as the RB1 and RB2 on the season. 37 points separate Hunt for the RB3 Leonard Fournette, who has 76 points. It would likely take an injury at this point to knock Gurley or Hunt out of the race to finish as the top running back in 2017. Finding the various statistics that stick out each week is the fun part. Applying these statistics to roster construction is where finding that edge comes in. While I share with you what I find I will always encourage you to use the links above to find information that you feel gives you your edge. Good luck this weekend and always feel free to reach out on Twitter @FFdeJENerate.